An article published in the journal “Nature” describes the first detailed observation of the environment surrounding a supermassive black hole outside the Milky Way. A team of astronomers led by Professor Hagai Netzer of the Tel Aviv University used the GRAVITY instrument installed on ESO’s VLTI to examine the first quasar discovered, known as 3C 273, uncovering gas clouds that move quickly around the black hole that powers that quasar and forms its heart. 3C 273 was discovered in 1959 and immediately became the center of a mystery. Initially it was identified as a radio source but was later associated with an optical source that turned out to be billions of light years away, later estimated at almost 2.5 billion light years. It wasn’t the first object of that kind discovered, but many astronomers had previously thought that those were variable stars while 3C 273 was considered something else from the beginning. In 1964 the astrophysicist Hong-Yee Chiu used the name quasar for the first time, an abbreviation of the expression quasi-stellar radio source. In the same year, Edwin Salpeter and Yakov Zel’dovich hypothesized that these objects were powered by accretion disks of materials orbiting supermassive black holes. Over the subsequent decades, increasingly powerful and sensitive instruments were used to study quasars, including 3C 273. It was also the target of a huge virtual telescope in March 2015. Recently, it was also observed with the GRAVITY instrument, installed on the Very Large Telescope Interferometer (VLTI) in Chile, which can provide excellent results in the study of very distant objects. Professor Hagai Netzer explained that the emissions created by the gas in the vicinity of the supermassive black hole are hallmarks of quasars. So far, the distance of the gas from the black hole, and occasionally the patterns of its motion, could be measured only with an old method based on variations in the quasars light. The GRAVITY instrument can resolve structures with a precision that Professor Netzer compared to observing a 1-Euro coin on the Moon. Jason Dexter of the Max Planck Institute for Extraterrestrial Physics (MPE), another of the authors of the research, added that information on gas motion and distance immediately around the black hole are crucial to measure its mass and for the first time the old method was experimentally tested passing the test with flying colors. The new method confirmed the previous estimate of the black hole’s mass in about 300 million times the Sun’s. 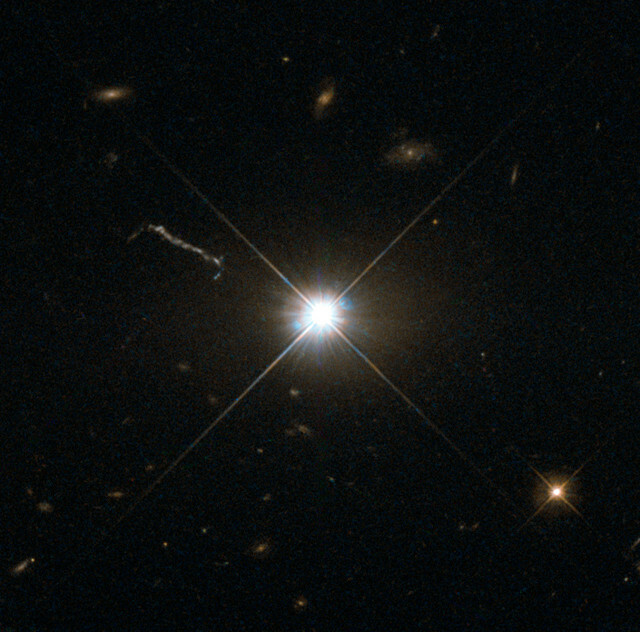 Within decades of its discovery, the quasar 3C 273 keeps on being studied revealing new details. This new study confirms previous measurements with a new method useful for more research and brings new information about a supermassive black hole, an object where physical conditions reach extreme levels that have a significant influence on its host galaxy. Quasars generate enormous amounts of electromagnetic emissions as long as there are enough materials around them and at switch off when they run out of materials leaving a normal galaxy, another phenomenon on astronomers are investigating.